I had a very productive afternoon at the yard yesterday. I finished tying the tarp down around 10:00, so it was a long day, but I managed to complete the port side core and about 3/4 of the starboard side. There is a small section of deck where the aft stanchions attach that remains to be done. I believe they were originally cored with balsa, but it's about 1/4" thick rather than the 1/2" material I have on hand. I'm not keen on using balsa in those spots, so I think I'm going to grind a bevel into the edge of the new 1/2" balsa and build up a laminate in that area instead using 10 oz. fiberglass cloth. This will ensure that the stanchion mounting bolts have a much more secure and watertight mount. It will also act as a built-in backing plate, simplifying another task. 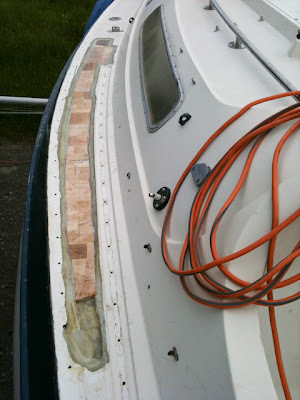 One lesson I've learned is that the ideal way to do this would include not having an unsecured hull to deck joint. 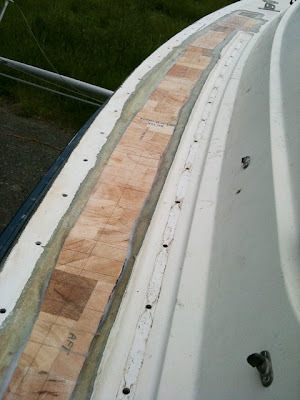 There is just the slightest flex allowed by it, and although I'm certain that the epoxy sets up while I'm not on the boat, it is something I would like to have eliminated if only because I'm a bit of a perfectionist. A second lesson is that if I were to do this again I would bring out a roll of wax paper and a set of 50 lb. sand bags to weight the lay up down while the epoxy sets. There are a few pieces here and there that aren't sitting perfectly flush. They are only off by about 1/16", and I'm certain they are floating on thickened epoxy, but it's another area that was just shy of being ideal. All things considered, I'm not concerned at all about the strength of this repair. The deck was rock solid when it was full of rotten pudding-consistency core, and it now has epoxy-saturated fresh balsa. I'm certain it will be stiff when it's done.